Out of all the boxes out there on the market, I have yet to find one that fits my lifestyle and by that I mean, something I can enjoy and share with my dogs. Disclosure: Golden Daily Scoop was sent The Nurturing Paw Subscription box for review purposes. All opinions expressed are our own. The Nurturing Paw is not responsible for the contents of this post. The Nurturing Paw® is a quarterly (seasonal) subscription box that has a unique twist to it by offering an organic and holistic spa experience to be enjoyed in your home to benefit both you and your dog. Founders, Karen Finkle and Debbie Miller are passionate about helping pet parents spend relaxing and quality time with their dogs. 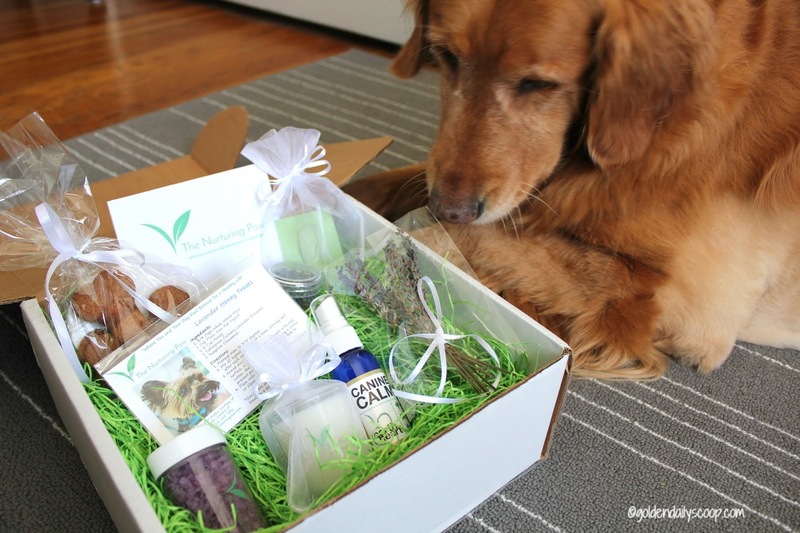 They are dedicated to empowering every pet parent with options to share an experience that brings balance and wellness to the owner and their dog. 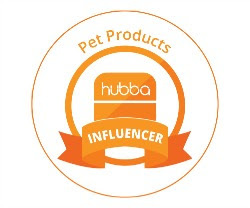 I love their mission of providing exceptional products, resources and awareness to healthy alternatives for owners and their dogs. To me, living a healthy lifestyle is so important and that is no different when it comes to my dogs. I think it's great that a company like, The Nurturing Paw helps dog owners find that balance for a healthy life. As I mentioned above, this is a quarterly subscription box so a new one comes out every season. This particular box is the Winter Serenity Care Package. After the winter that we just had here in the northeast, I was happy to welcome any serenity into our home. Opening the box was like opening a giant bouquet of lavender. If I could have crawled right inside that box, I totally would have and I'm pretty sure Miley would have wanted to join me! lol It smelled AMAZING! A luxurious, 2 oz. 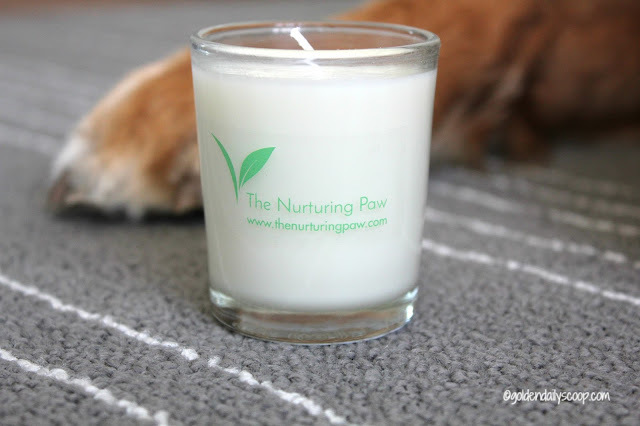 hand-crafted soy candle in a glass container with an all-natural cotton wick, organic soy wax, and premium fragrant oils, specially made for The Nurturing Paw. A nice, soft lavender scent - I can't wait to light this candle at my desk! A bouquet of fragrant and high quality French blue lavender. 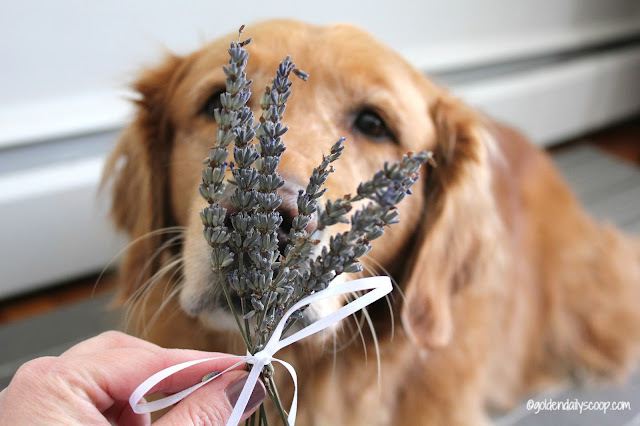 Miley loved the scent of the Lavender bouquet. I have a cute little vase in my bathroom for this bouquet! Botanical bath salts contain 100% concentrated botanical salt with natural lavender flowers and lavender essential oil. The minerals penetrate and stimulate the skin while gently washing away dead skin cells for smoother, softer skin. The mineral salts relax your muscles while the high sodium content helps your body maintain a stable and healthy pH level, creating a true Zen spa experience. Sounds perfect to me, I hear a nice long bath calling my name! Grade A+ clear Quartz crystal points from Brazil. 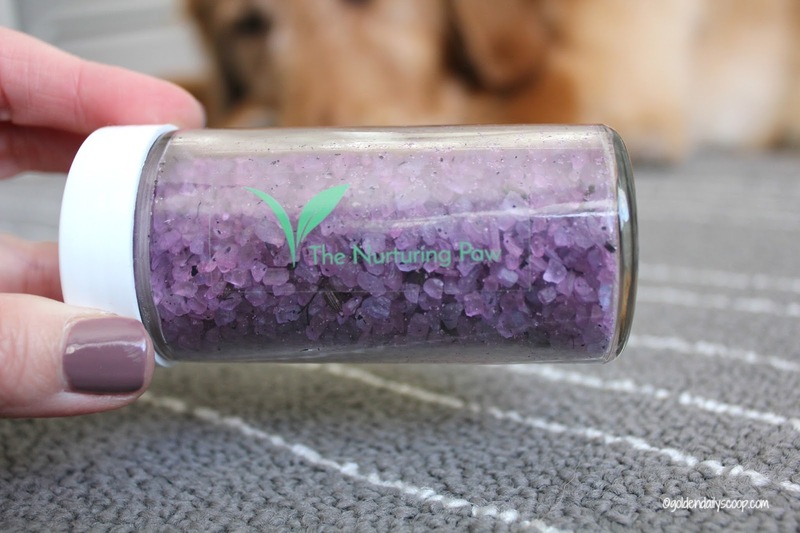 The benefits of this crystal is to enhance energy levels in dogs and boost the immune system, which will improve your dog's health and speed up the healing process. It's also helpful in deducing pain and inflammation. 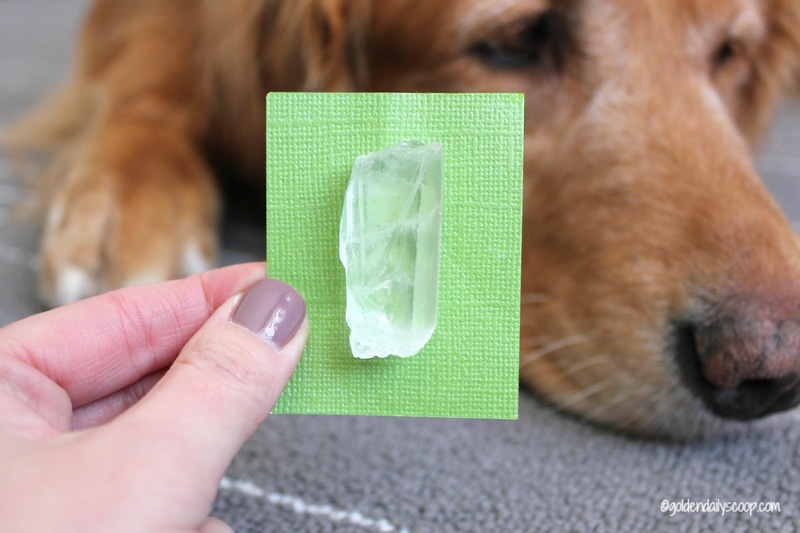 How to Use: Place crystal near your dog's favorite sleeping spot, making sure to keep it out of their reach and small children as it would be harmful is swallowed. You can also hold the crystal in one hand while petting your dog with the other. Pet owners can benefit from the crystal. Quartz is the most powerful healing stone and is known as the master healer, amplifying energy and promoting clarity of mind. I have heard positive things about crystals and have always wanted to try them but never knew where to start. Now I do and I can't wait to give this Quartz a try! 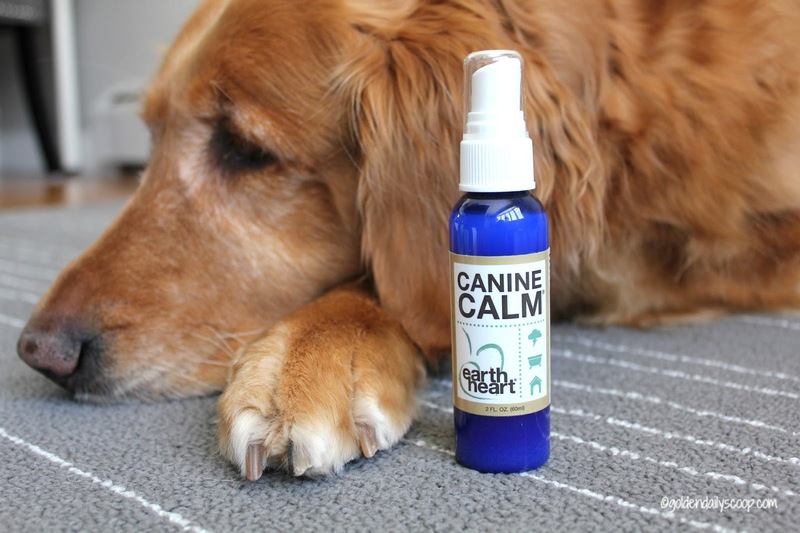 Canine Calm uses pure essential oils such as lavender and bergamot to help dogs relax during stressful times like thunderstorms, fireworks, grooming, vet visits, separation anxiety etc. This natural mist is made in the USA and packaged in a BPA free recyclable container. How to Use: It can be sprayed directly onto cloth, skin or fur at the first sign of upset. 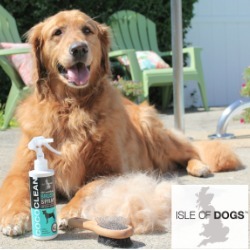 Just spray 1 or 2 mists on your fingertips and gently massage your dog's outer ears. Repeat if you don't see desired results in 10 minutes. 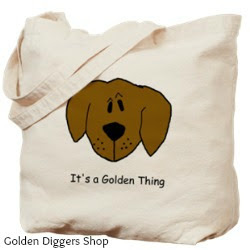 You can also mist their favorite blanket, bandana or bedding. 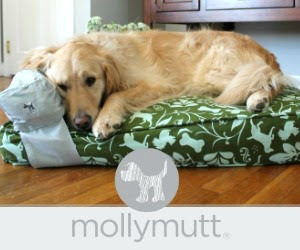 Having a Golden that suffers from anxiety, I know this will come in handy this summer with storms and fireworks. USDA organic lavender flower. Pure and natural, certified by CERES. Imported from the Provence region of France, culinary grade to enhance your favorite recipes. 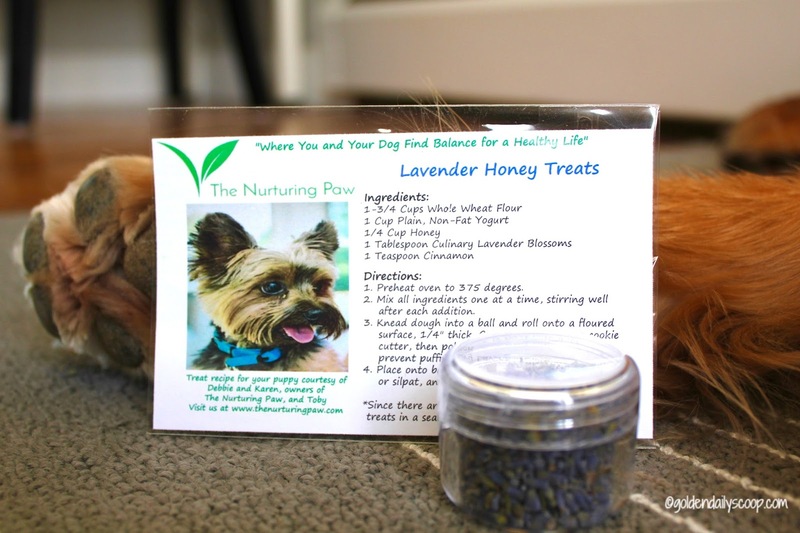 I have never baked with lavender before so I can't wait to make this recipe for the dogs. Stay tuned! 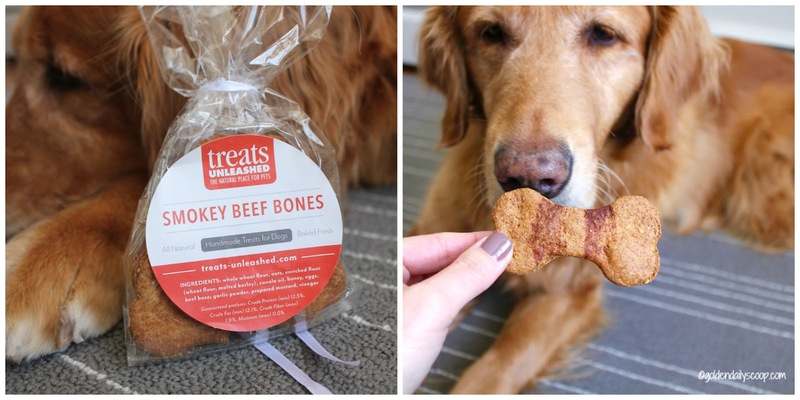 These treats are made by Treats Unleashed and are baked from scratch daily inside their stores. 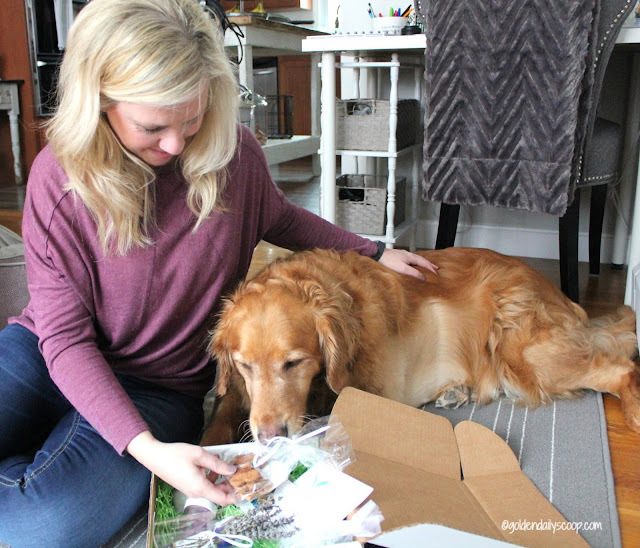 Their recipes were developed by a family member with a PhD in food science and animal nutrition and have been formulated for dogs using only human-grade ingredients. These treats have no artificial preservatives, chemicals or refined sugars added to them. Miley was drooling the minute I pulled the treat out of the bag! I love the concept of being able to have a spa experience and being able to share it with your dog by spending quality time together. Best of all, it's affordable and you don't need to leave your house. The common theme of the Winter box is lavender, something that we both can benefit from with it's healing and calming effects. The quality of the products are top notch, you can tell they put a lot of time and thought into it. 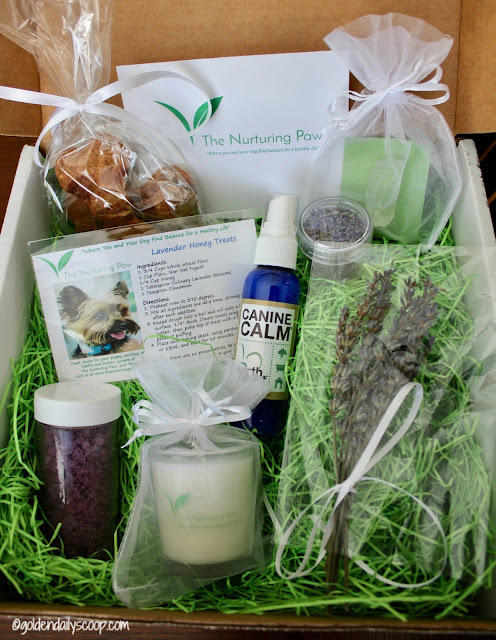 The Nurturing Paw subscription box gives me a chance to try and learn about new healthy alternatives for myself and the dogs and at the end of the day that is all that really matters; living a balanced, happy and healthy lifestyle for me and my dogs. 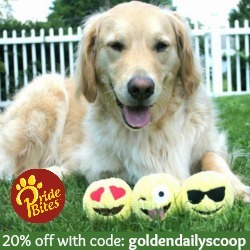 20% off a yearly subscription (4 Seasonal Boxes) or a 1 time purchase. 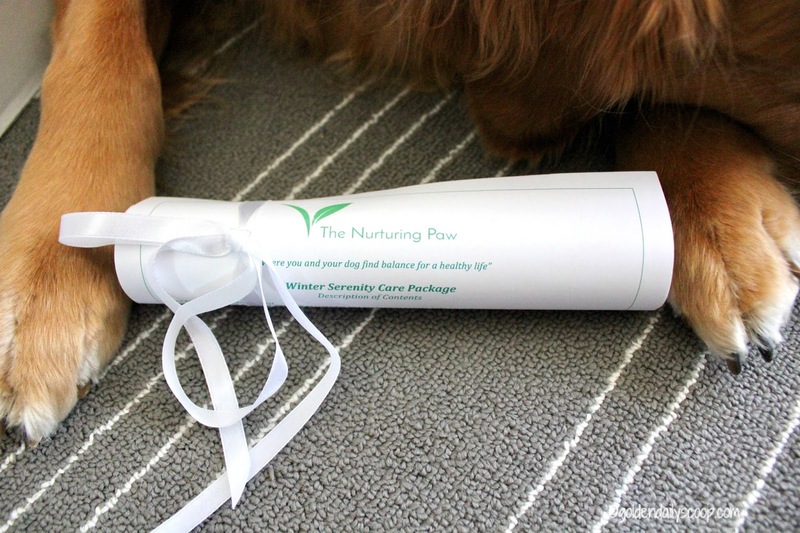 Visit The Nurturing Paw website, click on subscribe and enter the special discount code: GDSCOOP. What an excellent idea! We could all use some relaxation and pampering around here, and I love natural products like this. Hi Janet, this is Karen an Debbie with The Nurturing Paw...Thank you for your kind words and let us know if we can answer any other questions about our company. Hi Karen, I was supposed to receive one for a review but it was sent and never received. 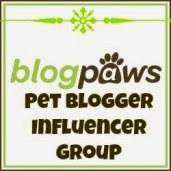 I was sure hoping to get a chance to share Nurturing Paw with my readers too.